As regular readers are aware, earlier this year the FilmStruck streaming service expanded its offerings from foreign, indie, and Criterion Collection films to also include a "TCM Select" line of rotating classic films from the Warner Bros. library. In all honesty, while it's attractive, FilmStruck hasn't been something I "need," simply because of my extensive personal film library, including many Criterion Collection films. However, I'm interested in things the service provides which aren't available elsewhere, such as the attractively curated collections of titles with brand-new FilmStruck intros by hosts such as Alicia Malone, Eddie Muller, and Ben Mankiewicz, and more importantly, long-form programming which can only be found on FilmStruck. 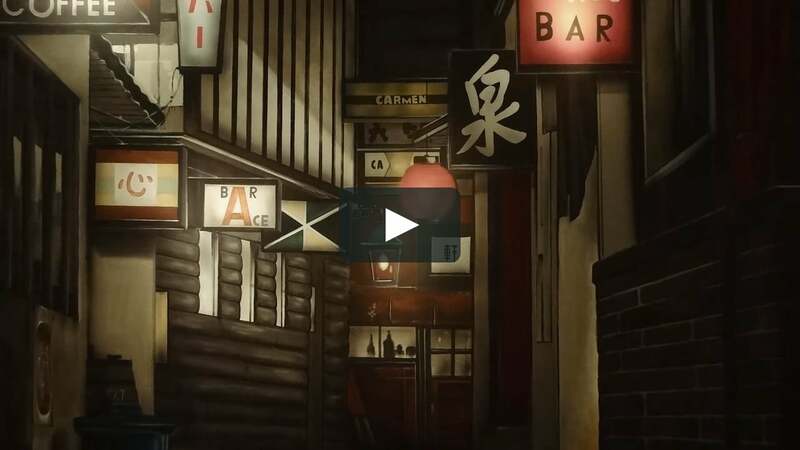 The new documentary IN SEARCH OF OZU (2018), about the great Japanese director Yasujiro Ozu, is a terrific example of the kind of unique presentation which could cause me to become a permanent FilmStruck subscriber. I activated my free month-long trial this weekend in order to watch this documentary, which I understand is currently only available on FilmStruck. 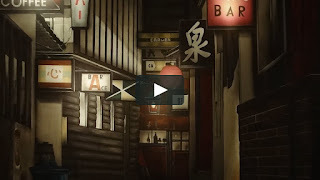 IN SEARCH OF OZU was written and directed by Daniel Raim, who was also behind the excellent documentary HAROLD AND LILLIAN: A HOLLYWOOD LOVE STORY (2015). 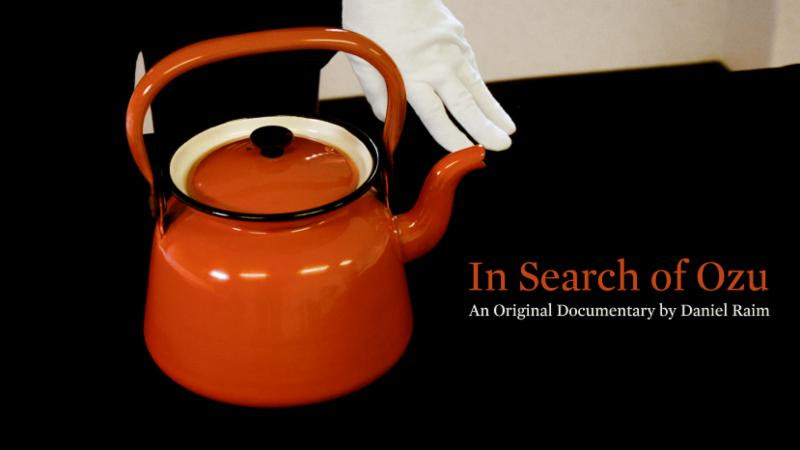 Filmed in Japan last year, the 46-minute documentary explores carefully stored museum pieces from Ozu's films, using them as the springboard to consider his career, particularly the color films made in the latter years of his filmography. 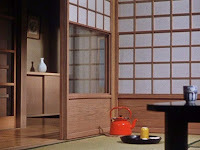 The film's consideration of graphic design and the use of color in these films is fascinating; while he variously had art and set decorators and production designers, to a large extent Ozu served as his own production designer, influencing the look of his films in countless ways. He was much more than a director; he was a visual stylist. Ozu designed and handwrote many of the title sequences for his films. He hand painted some of the cups seen in his movies, which still exist today, and coordinated wardrobes to complement carefully chosen posters and artwork. Ozu also personally designed the street signs for businesses such as the bars his characters frequent. One of the museum treasures we're shown is a beautiful red tea kettle chosen by Ozu; it's jokingly referred to as the "teleporting tea kettle" because of the way it randomly turns up in various shots. Another fascinating artifact was the "crab legs" low tripod from which he shot so many low angle scenes. 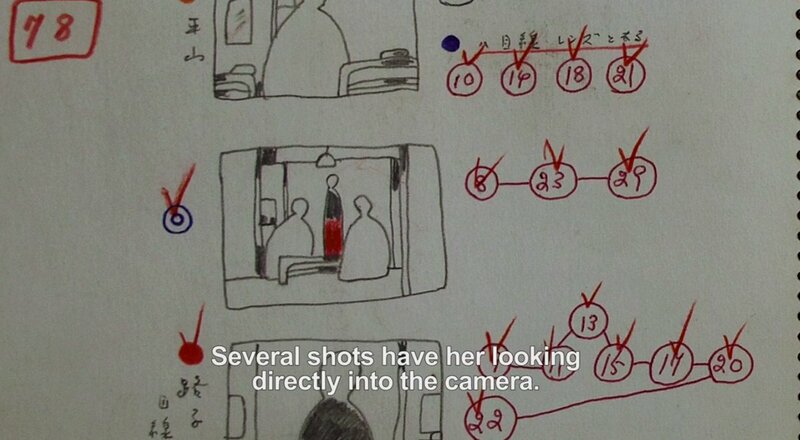 After collaborating with others on scripts, Ozu would write the complete movie scripts out in notebooks using handwritten Japanese characters; he then color coded the pages for different characters and to match numbered storyboards. 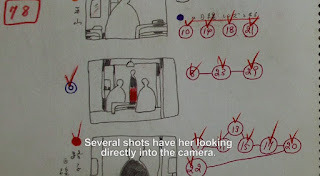 Ozu would "see" a film more as a series of visuals than as written words; peeking into his creative process via these notebooks is quite fascinating. The film has additional insights provided by Japanese film historians, along with Ozu's nephew and the producer of his last film, AN AUTUMN AFTERNOON (1962). So that potential viewers understand what the film does and doesn't cover, the film touches briefly on Ozu's personal life, particularly his close relationship with his mother, and discusses in efficient fashion how his career evolved over the decades, but it's not an in-depth look at his complete career; for example, it doesn't delve into Ozu's longstanding collaborations with actors like Setsuko Hara and Chishu Ryu, and it doesn't review most of his films in extensive detail. 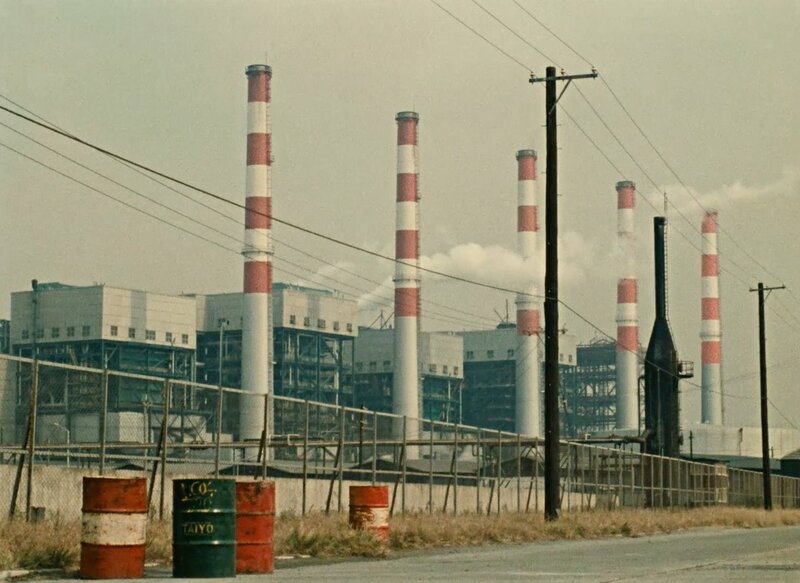 And since the focus is on Ozu's use of color and design, his black and white films are only mentioned briefly. That explained, IN SEARCH OF OZU does an excellent job keying viewers in on some of the things which made Ozu's films so memorable and visually striking. My favorite Ozu films are his color films, for just this reason, so I particularly appreciated and enjoyed the documentary. I highly recommend it both for those who already love Ozu and those who are just discovering his movies, as it provides a guide to interesting aspects to watch for in his films. A clip from the documentary may be seen at the Criterion site. Regarding the FilmStruck service, I'm not sure if it was a transient issue or something more problematic, but I did have trouble streaming FilmStruck on my TV via my Roku, as it constantly paused to buffer. After 15 minutes of interruptions I switched to watching the documentary on my iPad and had no problems at all. For those wishing to try FilmStruck, visit the FilmStruck website to sign up for a free two-week trial subscription. The regular monthly fee, including TCM Select films, is $6.99; adding the Criterion Channel brings the monthly cost to $10.99. For those willing to make a long-term commitment, the annual fee of $99, including the Criterion Channel, saves subscribers $32 per year. 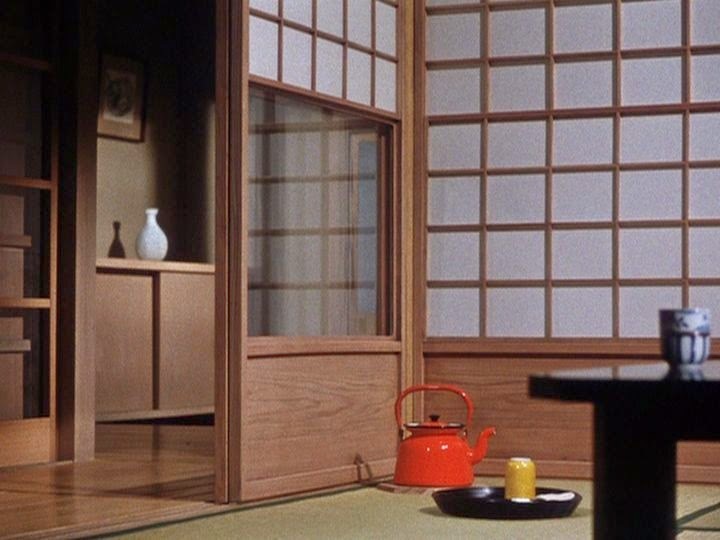 For related links, here are my past reviews of Ozu films: LATE SPRING (1949), EARLY SUMMER (1951), TOKYO STORY (1953), EQUINOX FLOWER (1958), GOOD MORNING (1959), LATE AUTUMN (1960), and THE END OF SUMMER (1961). Was very happy to read your take on all the Ozu films you've seen so far. For one, it helped me remember which one's I've seen. With all the titles so similar and family plots so similar frankly, I find it hard telling one from another. But ever since I, just by chance, saw my first Ozu film on TCM a few years back I have become an instant fan. Since then I've watched all other Ozu films TCM has played (not nearly enough of them). And like you I took advantage of the Barnes & Noble Criterion sale and bought the Late Ozu box also Autumn Afternoon & Early Summer. I've seen all of these now except for the silent "Tokyo Chorus" film TCM recently showed. I prefer "talkies" even if I can't understand Japanese. I've been very impressed with the beautiful and expressive Setsuko Hara & the apparently very versatile Chishû Ryû. As I thought he was an old man also till I saw him as a young man in movies after his old man roles. These are both fine actors. Happy to find anoter Ozu fan. Would now love to be able to buy the Ozu film "Hen In The Wind" but it isn't available in the U.S. I see a Bluray/DVD version is available in U.K. I have a all region DVD player but I'm not real sure this set I found on Amazon does contain a PAL DVD version or is it just Region 2 Bluray? Well, that's what's stopping me from taking the plunge. May get brave and try it. I like all old movies, classic comedies, '50's westerns, old TV, and many foreign films. Also really liked Il Sorpasso, recommend this to you if you haven't seen it. Hi Lee, Thanks so much for your comments. It's interesting, the titles and plots of Ozu's films are similar, as well as the casts, but I recently reread my own reviews to refresh my memory in that regard, and it was interesting to be reminded how "deep" and meaningful each individual film is, despite the similarities. I'm hoping to watch another of his films soon, perhaps TOKYO TWILIGHT or AN AUTUMN AFTERNOON. Ryu seems rather like Walter Brennan and John McIntire in that he was able to play "old" so effectively. It was rather a shock to realize his actual age! I hope all Ozu's films not yet available on Region 1 will turn up at some point. Meanwhile I was glad that RECORD OF A TENEMENT GENTLEMAN turned up on TCM in recent months. I don't know IL SORPASSO and will keep it in mind. Thank you! And thanks again for sharing your thoughts on Ozu! Yes, I got Record Of Tenement Gent also and watched it, that was the same night they also played "Tokyo Chorus" that silent 1931 Ozu movie I haven't seen yet (but will). Luckily my DVD recorders still work (you know, unbelievably, they don't sell them anymore in the U.S.!!) By the way, Tokyo Story is EXCELLENT, it was very much like a Japanese version of "Make Way For Tomorrow". One of the Ozu classics. I've discovered today that FilmStruck has a number of Ozu titles which I don't believe are on U.S. DVD, including some early '30s titles and '40s films such as THE FLAVOR OF GREEN TEA OVER RICE and HEN IN THE WIND. (HEN IN THE WIND sounds heavier than the usual Ozu family drama!) I see some Ozu viewing in my future! I wonder why DVD-R recorders are becoming hard to find? I rely on mine so I hope it holds on for a long time. Will have to start hunting for a backup.